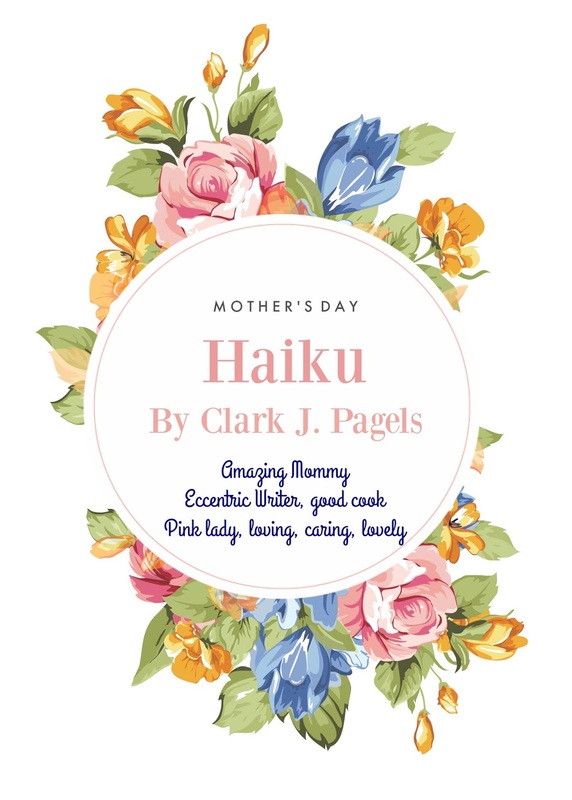 My son, Clark J. Pagels, 15, wrote me this haiku for Mother's Day. Of course, I love it! I'm sharing it as Clark's guest post for today! Isn't this the sweetest thing ever? Wishing you all a fantastic Mother's Day! Wishing peace for those who are suffering, like my older sister, who have lost children and may happy memories comfort all of you! Yesterday, God gave me a very nice Mother's Day gift -- I am a finalist in the prestigious Holt Medallion Awards for my Romance Novella, "The Steeplechase," which is set here where we live! God bless our readers and God bring healing to our current bloggers, Teresa Mathews and Bonnie Roof, and to our former bloggers Diana Flowers, Noela Nancarrow, and Marian Baay! Oops,had a typo so deleted comment. Aww, what a sweet Mother's Day gift from Clark, Carrie! Congratulations on being a finalist in the Holt Medallion Awards to Steeplechase!!!! Woo-woot! Thanks, Tina! I don't think you'll believe how tall he has gotten since you've seen him! I love his haiku! I am thrilled about the Holt Medallion finalist for The Steeplechase! Carrie, Happy Mother's day! What a beautiful gift Clark could possibly have given you! Congratulations also on being a finalist.I hope you win! Thanks, Sr. Mary Lou! you should see Clark's new hair cut! He has all that thick curly dark hair up top and the sides and back are super short. PTL I am a finalist -- the Lord has given me favor! Amen! Congrats on being a finalist, Carrie - a beautiful remembrance from Clark also, "Happy Mother's Day"!! Happy Mother's Day, Angel Bonnie! I printed out a copy of this and plan to put it in my Clark photo album as a memory! Thanks for your help with this novella! Blessings! I love the haiku, Carrie. My now 15 year old son wrote me a poem last year for Mothers Day. Aren't they the sweetest! Congratulations Carrie for The Steeplechase's recognition and Happy Mothers Day. Thanks, Terrill! My son is a really special guy! So sweet! Thanks! PTL about The Steeplechase! What a shock! Congrats on being named a finalist in the Holt Medallion Awards and Happy Mother's Day, Carrie! Loved the sweet haiku by Clark. The eccentric writer part gave me a chuckle. I had better leave that one alone. haha Thank you for requesting prayer for me and the other girls. We're still overcoming with God. Love you! Thanks -- PTL about being a Holt Medallion finalist, what an honor!!! I loved the eccentric writer part too as did Jeff haha!!! Yes, we are all overcoming with God. He's not done with us yet! Love you, too! CARRIE, Congratulations on being names a Holt Medallion finalist! I'm so excited for you! Hope you had a lovely Mother's Day! Clark's haiku is so sweet! He is so talented! Thanks so much sweet CARYL!!! I am so honored and humbled by finaling in the Holt Medallion Award for "The Steeplechase" which is set right here where I live! Clark is sweet, thanks! Congratulations on being a Holt Medallion finalist, Carrie. How special and I'm thrilled for you. Clark's haiku is so special just for you. God bless. Prayers for those who needs a healing touch from the Great Physician, Jesus Christ. Thanks, Marilyn! It is a God thing that I am a finalist. I love Clark's Haiku, it is very touching. Thanks for those prayers and offering some up, too!